Gather in Fort Point&apos;s District Hall building. Where to Gather, a restaurant on the South Boston waterfront, envisioned by Mayor Tom Menino as the city’s Innovation District. The restaurant is located inside District Hall, a building that serves as a collaborative hub for the community. What for Dinner after a hackathon or a brainstorming session with entrepreneurial tech types; drinks after a talk at the ICA, just a few steps away. The scene District Hall stands out against a backdrop of square brick buildings: It is all angles and sleek silver surfaces. Inside you’ll find yards of dry-erase boards, a cafe called Brew, and Gather, from the Briar Group (City Table, M.J. O’Connor’s, and more). The restaurant is fronted by windows, with wood tables and metal chairs and stools. The game is on the TV over the bar. Perforated panels are set into the ceiling at angles, with mismatched bulbs and cords dangling down like vines. 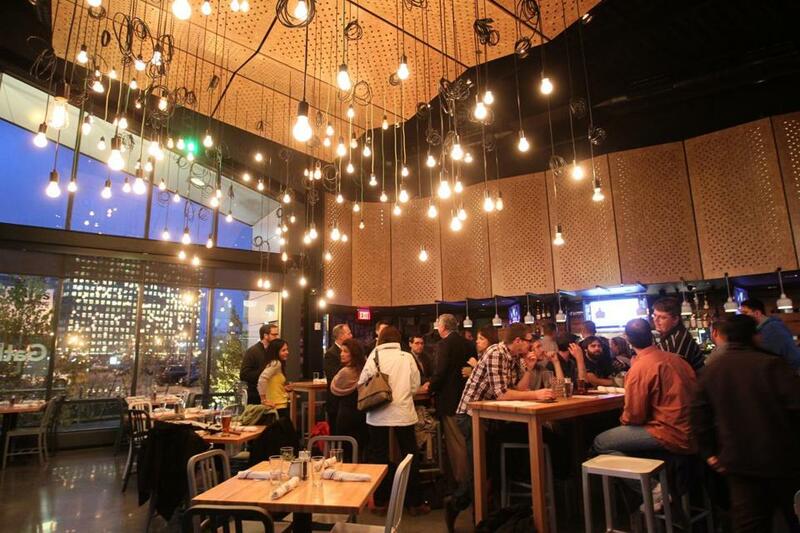 At communal tables, rows of friends and colleagues share appetizers and sip pints. Fellows in ties sit beside arty types in striped shirts and oblong black glasses. There are plenty of man bags. As the night wears on, business casual goes home and flannel shirts arrive. A couple is embracing for longer than is generally considered seemly in public. A guy roams the restaurant moodily, drinking a small glass of whiskey. At the bar, someone is taking apart his cellphone. Outside, people bike away into the night, calling out their farewells. What you’re eating You’ll find the likes of braised oxtail and potato pizza, veal gnocchi, salads and sandwiches, and snacks such as chips and dip and duck fat chicken wings. 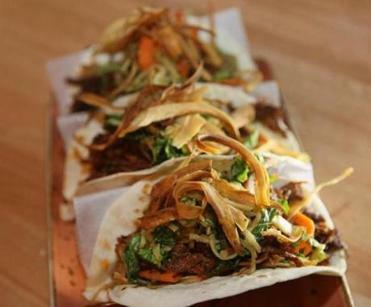 The roast duck tacos, with apple kimchi and salsify chips, appear to be popular. Care for a drink? Most people are drinking beer, from Allagash White to Left Hand Milk Stout Nitro. The cocktail list offers sangrias, sidecars, and a potion called The Monk: tequila, Chartreuse, lemon, white pepper, and honey. Devra First can be reached at dfirst@globe.com. Follow her on Twitter @devrafirst.